I had a day off and decided to take my two oldest children fishing with me to scout around for upcoming charters. They’ve never been fishing with me on a “serious” fishing trip and I wasn’t sure how things would go. I didn’t know if they would get bored, tired, hungry, fussy… etc. But, they did great. In part because the fishing is so good right now. Claire loves to be on the water and today was her lucky day. 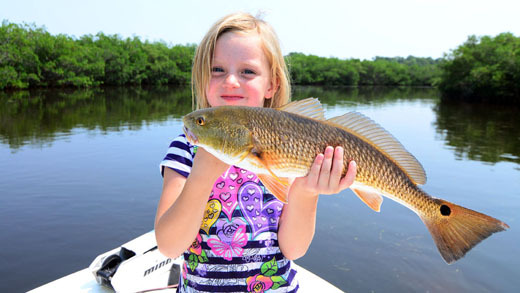 She got her first “Inshore Slam”. I don’t think she knows what a big deal that is but she loved doing it none the less. I tried to tell her that there are adults who live and fish here and have never caught a redfish, snook, and trout all in the same day. But all she could think about was how “big” her fish were. She later told mommy that “today was the best day she ever had”. Made me grin REAL big. Cade loves fishing. He’s been on “family fun” fishing trips and one other fishing trip with just dad before. And, we have spent countless hours bass fishing in the neighborhood lakes. But, it’s looking like he’s getting so into fishing that I could take him on most of my scouting trips, no problem. Anyway, on to the fishing. Bait was extremely easy to get. It’s has started to show up every where in the central Pasco area and I threw the net 3 times and had between 800 and 1000 sardines. We decide to sit right there in the bait spot for a few minutes and the kids wore out the ladyfish and a few trout. But, the reason for the trip was to check on some red, snook and trout spots so after bending a pole on ladyfish, we headed south. The first spot didn’t take long to produce. Both kids got hooked up on some medium sized snook pretty quickly. Shortly after that, they each got a few redfish. Then they really enjoyed catching the 5lb jacks that came through. Cade said he thought they fought like tarpon. I didn’t argue with him. So after catching several snook and redfish and putting our limit of redfish in the boat, I told them we should head home. To my surprise (after 4 hours of fishing) they weren’t real happy about quitting fishing but we headed that direction anyway. When we got near the Cotee river, I asked them if they wanted to try to get some keeper trout before we actually head in? They both gave me an emphatic headshake and “yes”. So we headed over to a spot that had a lot of milling mullet around and we pitched our sardines out towards the mullet school. It wasn’t long before Claire got another red. then cade got another redfish. Then Claire got the Trout of the day, measuring 22″ long.